GENEVA—Stating that the data published within its pages represented the scientific consensus of top researchers around the world, the U.N. Intergovernmental Panel on Climate Change released its annual report this week, which consists solely of an alphabetized list of every country on earth and the years each of them will become uninhabitable. 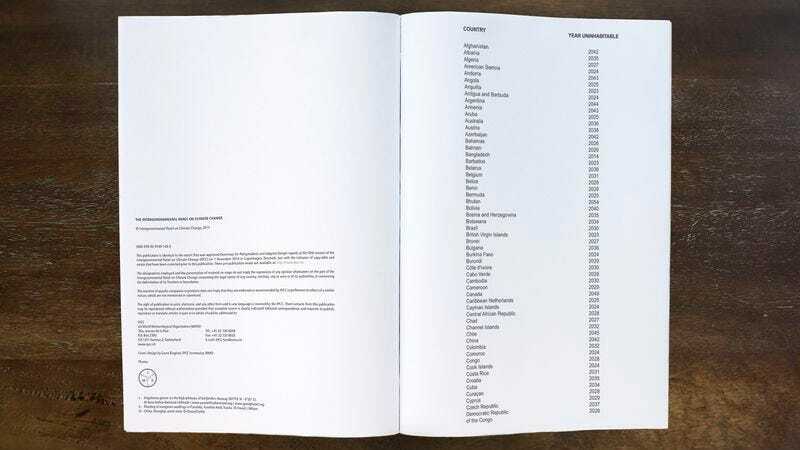 “Albania, 2035; Algeria, 2027; American Samoa, 2024,” read the two-page report, divided into two columns containing no text other than the names of the more than 200 countries and sovereign territories on the planet alongside the date by which that location’s inhabitants will no longer be able to survive the conditions brought on by global warming. “Cameroon, 2029; Canada, 2049… Japan, 2041… United States of America, 2033.” When reached for comment, the committee expressed its hope that the report would be used by governments around the globe to help them make forward-thinking, evidence-based decisions about how and when to euthanize their populations.